Priyanka Chopra, either made a deliberate attempt to go unnoticed or effortlessly get noticed, what ever may be the reason, we here on the style desk can spot her sitting miles away. 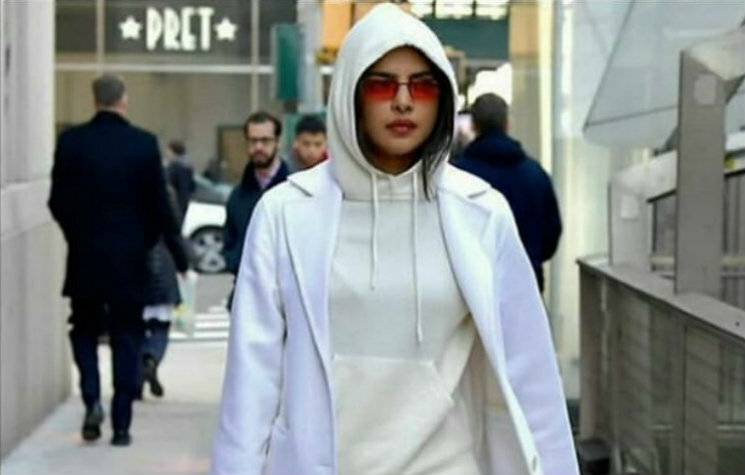 The Sky Is Pink actress, Priyanka Chopra, gave out strong vibes as though she was trying to hide from her fans on New York City streets by wearing the hood up and. Pair of red mini sunglasses. Although she tried real hard but she turned everyone's heads towards her and also the camera lenses. Courtesy her all-white look which brought back memories of Ranveer Singh's most trolled white outfit, A monotone white outfit that the Simmba actor wore to Shahid Kapoor's pre-birthday bash. Ranveer who is not just known for super amazing acting chops but also his quirky style picks, had worn a white hood and matching bottoms. Which was trolled and mocked by twitteratis and how!! Back to PC!! Priyanka wore a white Mongolian cashmere hoodie and bottoms from the London based, sustainable clothing brand Mandhkai. She stepped the look with an iconic Akris Ai bag, a pair of suede heels and red sunglasses. Our desi girl, recently hit the headlines after her husband nick Jonas gifted her Mercedes Maybach. Priyanka even took to her social media account to share the new addition of wheels to her already eponymous fleet of cars. We could draw some resemblance between Priyanka new and Ranveer's old white looks, could you? Let us know in the comments below.